NIST physicist Krister Shalm with the photon source used in the Bell test that strongly supported a key prediction of quantum mechanics: There are in fact spooky actions at a distance. BOULDER, Colo.—Einstein was wrong about at least one thing: There are, in fact, "spooky actions at a distance," as now proven by researchers at the National Institute of Standards and Technology (NIST). Einstein used that term to refer to quantum mechanics, which describes the curious behavior of the smallest particles of matter and light. He was referring, specifically, to entanglement, the idea that two physically separated particles can have correlated properties, with values that are uncertain until they are measured. Einstein was dubious, and until now, researchers have been unable to support it with near-total confidence. As described in a paper posted online and published in Physical Review Letters (PRL),* researchers from NIST and several other institutions created pairs of identical light particles, or photons, and sent them to two different locations to be measured. Researchers showed the measured results not only were correlated, but also—by eliminating all other known options—that these correlations cannot be caused by the locally controlled, "realistic" universe Einstein thought we lived in. This implies a different explanation such as entanglement. The research team achieved this feat by simultaneously closing all three major "loopholes" that have plagued previous Bell tests. Closing the loopholes was made possible by recent technical advances, including NIST's ultrafast single-photon detectors, which can accurately detect at least 90 percent of very weak signals, and new tools for randomly picking detector settings. "You can't prove quantum mechanics, but local realism, or hidden local action, is incompatible with our experiment," NIST's Krister Shalm says. "Our results agree with what quantum mechanics predicts about the spooky actions shared by entangled particles." The NIST paper was published by PRL with another paper by a team at the University of Vienna in Austria who used a similar high-efficiency single-photon detector provided by NIST to perform a Bell test that achieved similar results. The NIST results are more definitive than those reported recently by researchers at Delft University of Technology in the Netherlands. In the NIST experiment, the photon source and the two detectors were located in three different, widely separated rooms on the same floor in a large laboratory building. The two detectors are 184 meters apart, and 126 and 132 meters, respectively, from the photon source. The source creates a stream of photon pairs through a common process in which a laser beam stimulates a special type of crystal. This process is generally presumed to create pairs of photons that are entangled, so that the photons' polarizations are highly correlated with one another. Polarization refers to the specific orientation of the photon, like vertical or horizontal (polarizing sunglasses preferentially block horizontally polarized light), analogous to the two sides of a coin. Photon pairs are then separated and sent by fiber-optic cable to separate detectors in the distant rooms. While the photons are in flight, a random number generator picks one of two polarization settings for each polarization analyzer. If the photon matched the analyzer setting, then it was detected more than 90 percent of the time. 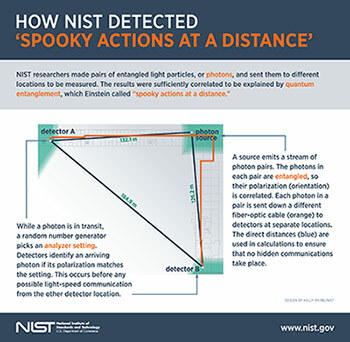 Fair sampling: Thanks to NIST's single-photon detectors, the experiment was efficient enough to ensure that the detected photons and measurement results were representative of the actual totals. The detectors, made of superconducting nanowires, were 90 percent efficient, and total system efficiency was about 75 percent. No faster-than-light communication: The two detectors measured photons from the same pair a few hundreds of nanoseconds apart, finishing more than 40 nanoseconds before any light-speed communication could take place between the detectors. Information traveling at the speed of light would require 617 nanoseconds to travel between the detectors. To further ensure that hidden variables such as power grid fluctuations could not have influenced the results, the researchers performed additional experimental runs mixed with another source of randomness—data from popular movies, television shows and the digits of Pi. This didn't change the outcome. The experiment was conducted at NIST's Boulder, Colo., campus, where researchers made one of the photon detectors and provided theoretical support. Researchers at the Jet Propulsion Laboratory (Pasadena, Calif.) made the other detector. Researchers at NIST's Gaithersburg, Md., headquarters built random number generators and related circuits. Researchers from the University of Illinois (Urbana-Champaign, Ill.) and the University of Waterloo and University of Moncton in Canada helped develop the photon source and perform the experiments. Researchers at the Barcelona Institute of Science and Technology in Spain developed another random number generator. Funding for NIST contributions to the experiment was provided, in part, by the Defense Advanced Research Projects Agency. As a non-regulatory agency of the U.S. Department of Commerce, NIST promotes U.S. innovation and industrial competitiveness by advancing measurement science, standards and technology in ways that enhance economic security and improve our quality of life. To learn more about NIST, visit www.nist.gov. * L.K. Shalm, E. Meyer-Scott, B.G. Christensen, P. Bierhorst, M.A. Wayne, D.R. Hamel, M.J. Stevens, T. Gerrits, S. Glancy, M.S. Allman, K.J. Coakley, S.D. Dyer, C. Hodge, A.E. Lita, V.B. Verma, J.C. Bienfang, A.L. Migdall, Y. Zhang, W.H. Farr, F. Marsili, M.D. Shaw, J.A. Stern, C. Abellan, W. Amaya, V. Pruneri, T. Jennewein, M.W. Mitchell, P.G. Kwiat, R.P. Mirin, E. Knill and S.W. Nam. A strong loophole-free test of local realism. Physical Review Letters. December 16, 2015. DOI: 10.1103/PhysRevLett.115.250402. Note: Release updated on Dec. 16, 2015, to note publication of the two PRL papers.